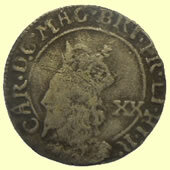 Despite enduring a sickly childhood Charles matured into a strong-willed Stuart monarch and an advocate of the divine right of kings. 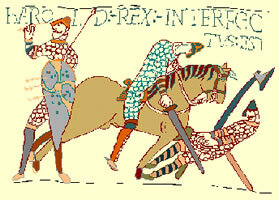 It was his strength, however, that proved his nemesis. 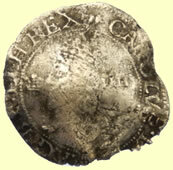 After repeated mismanagement of royal affairs - in a style akin to his father James I - Charles was forced into conflict with Parliament that led to civil wars, first with Scotland in 1637, then with England (in 1642-46 and again in 1648), ending with his death by execution. 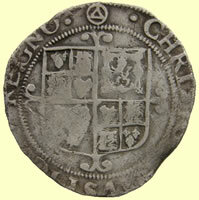 The second son of James I, King of Scotland and England, and Anne of Denmark, Charles was born a Scottish prince in Fife. 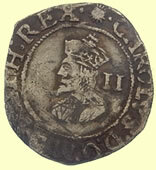 He became heir to the throne following the death of his brother Henry. 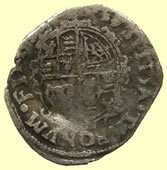 His manner was reserved - he suffered a residual stammer - and self-righteous. 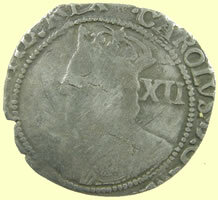 His refined tastes and love for the arts put a great deal of pressure on the royal budget, rapidly increasing the crown's debts. 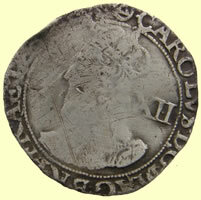 The other relevant aspect of his character, which hugely influenced contemporary events, was Charles' religiosity; he was a supporter of high Anglican worship which encouraged ritual and decorum. 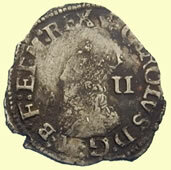 His marriage to Henrietta Maria of France, a Roman Catholic, added to his unpopularity. 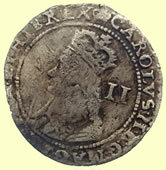 Charles' reign began with an unhappy friendship with George Villiers, Duke of Buckingham, who used his influence against the wishes of other nobility. 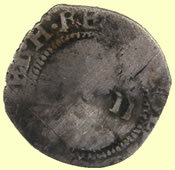 Buckingham was assassinated in 1628. 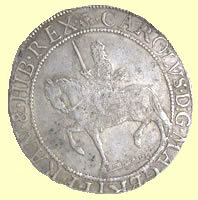 Meanwhile, Charles had dissolved Parliament three times between 1625 and 1629 then chose to rule without summoning Parliament for 11 years. 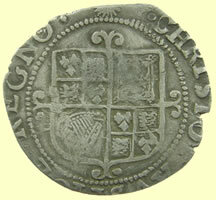 Unrest in Scotland - because Charles attempted to force a new prayer book on the country - put an end to his personal rule. 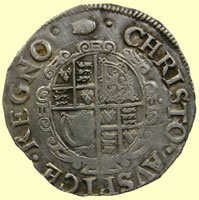 Funds to quash the rebellion were limited and Charles was forced to call first the Short Parliament then the Long Parliament. 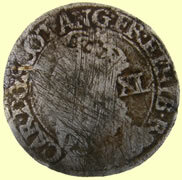 Conflict in the House led to a foolish decision, prompted by Henrietta, to have five members arrested and civil war erupted. 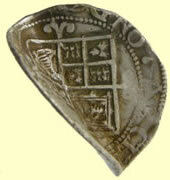 In 1642 the royal standard was raised by Charles at Nottingham against the Parliamentary forces. 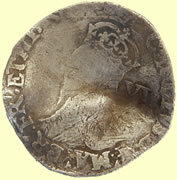 The king's supporters, known as the Cavaliers, came from the ranks of peasants and nobility who fought against the militia drawn from the emerging middle classes, Puritans known as the Roundheads. 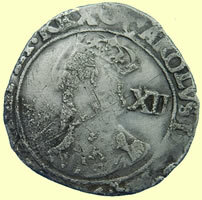 Led by Oliver Cromwell, the New Model Army routed the Cavaliers at Naseby in 1645 and Charles surrendered a year later to the Scottish forces. 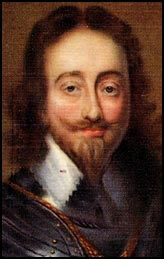 In 1648 he was put on trail for treason and the king was found guilty by one vote (68 to 67) and his execution was ordered for 1649. 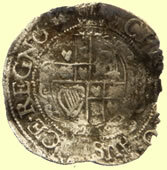 The "English Civil War" of the mid-17th Century was part of a wider conflict that involved Scotland and Ireland as well as England and Wales. 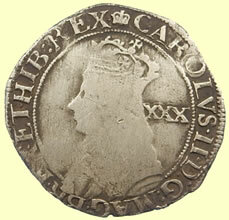 Also called "The Wars of the Three Kingdoms" and the "English Revolution", the British Civil Wars and Commonwealth period laid the foundations of the modern British constitution. 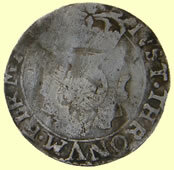 From the signing of the Scottish National Covenant of 1638 to the Restoration of the Monarchy in 1660, this site explores the turmoil of the Civil Wars and Interregnum, and the constitutional experiments of the Commonwealth and Protectorate period of the 1650s. 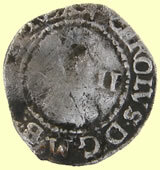 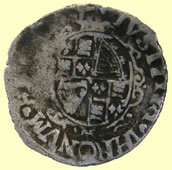 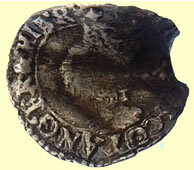 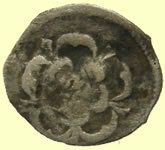 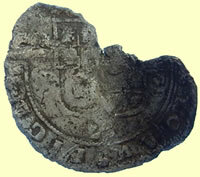 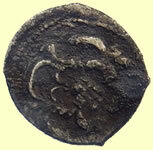 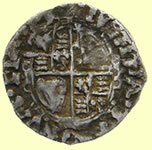 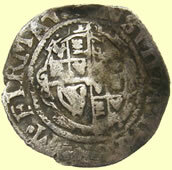 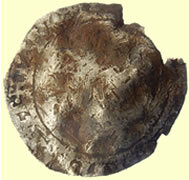 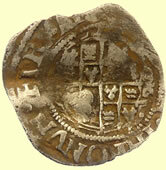 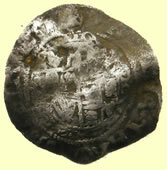 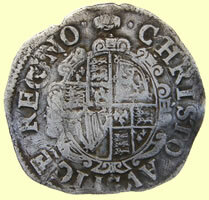 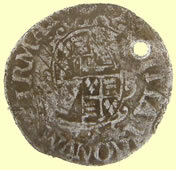 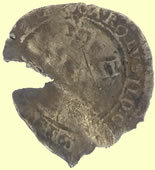 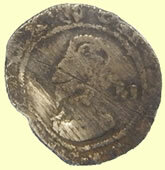 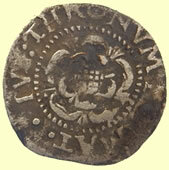 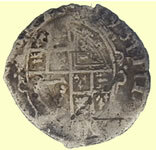 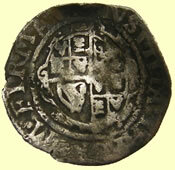 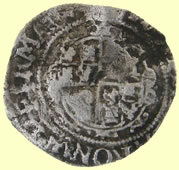 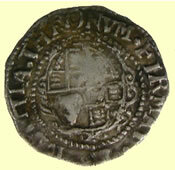 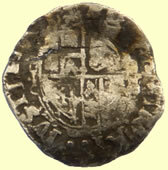 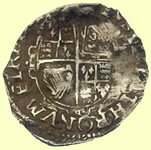 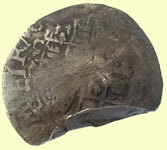 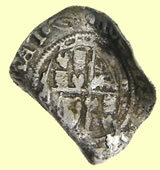 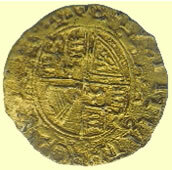 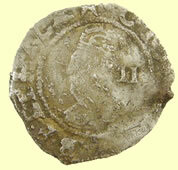 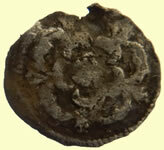 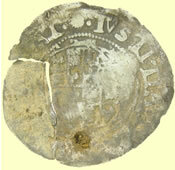 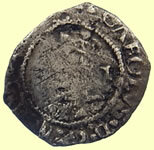 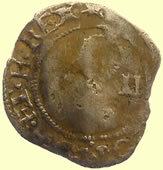 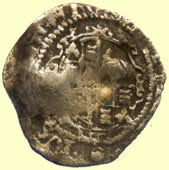 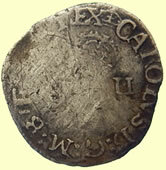 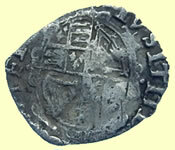 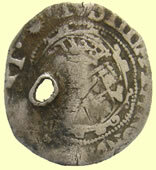 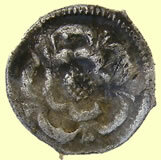 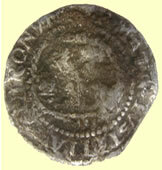 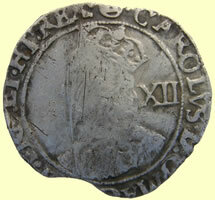 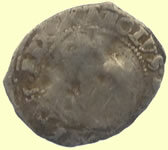 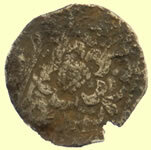 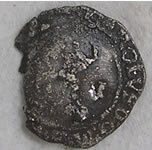 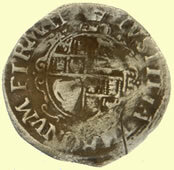 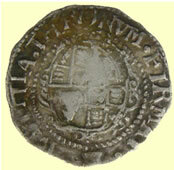 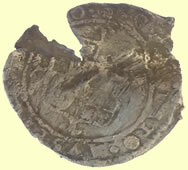 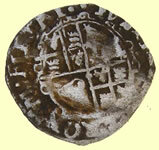 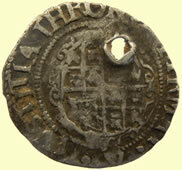 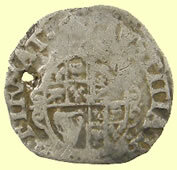 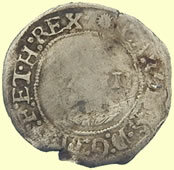 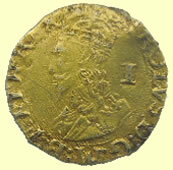 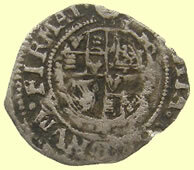 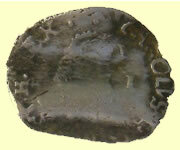 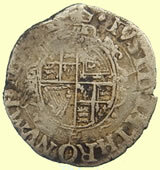 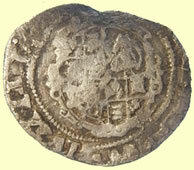 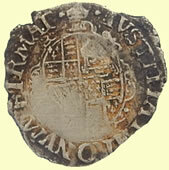 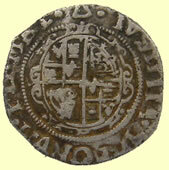 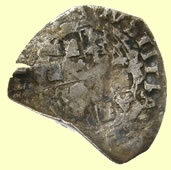 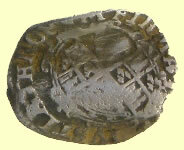 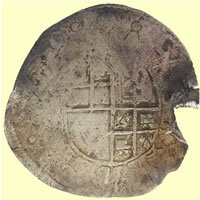 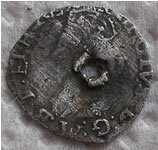 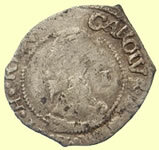 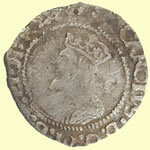 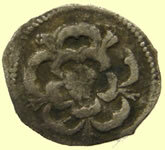 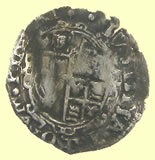 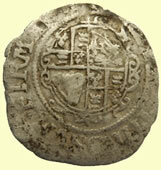 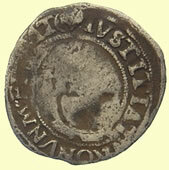 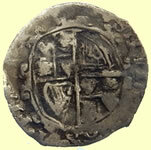 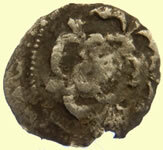 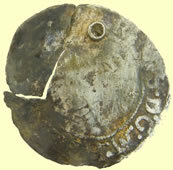 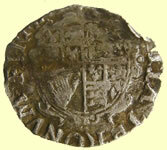 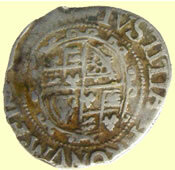 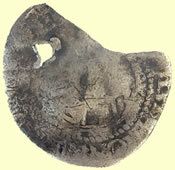 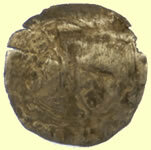 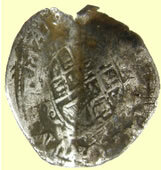 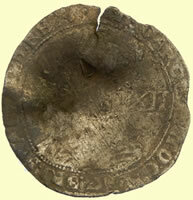 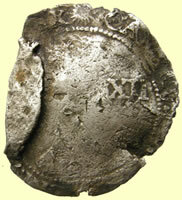 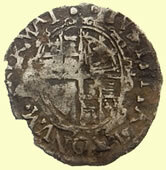 Charles 1st hammered silver gilded penny - fake gold during civil war rebellion at Colchester ?? 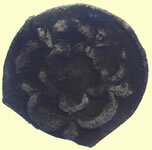 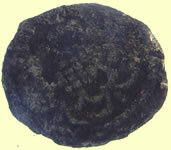 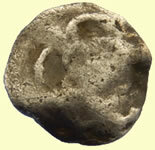 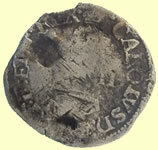 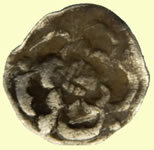 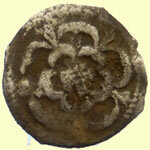 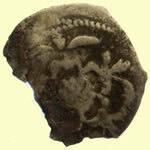 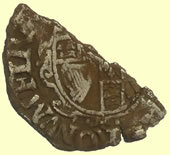 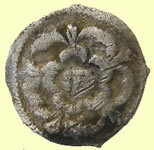 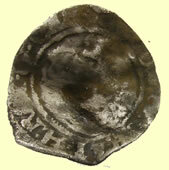 Fantastic find - one of the earliest milled coins during the hammered silver coin period. 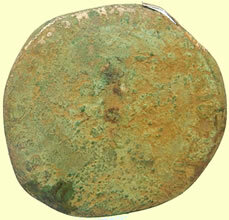 This coin has me totally stumped !! 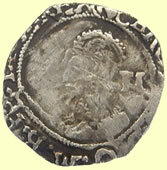 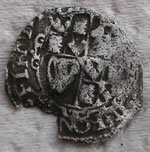 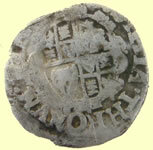 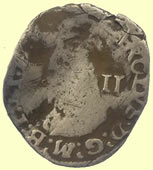 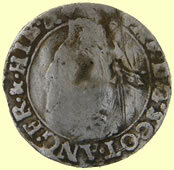 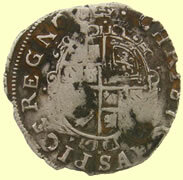 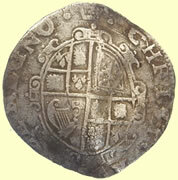 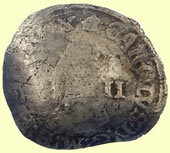 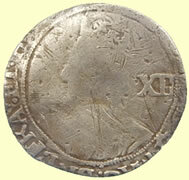 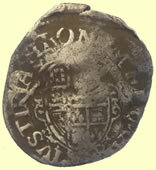 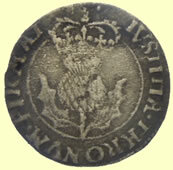 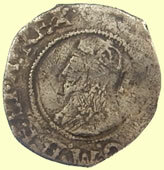 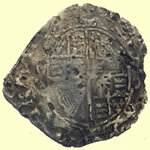 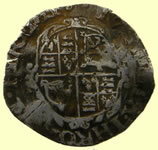 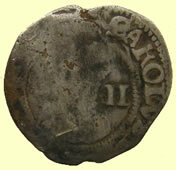 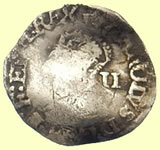 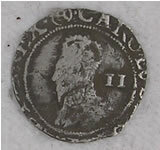 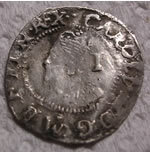 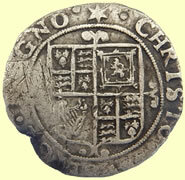 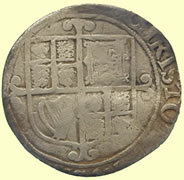 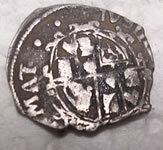 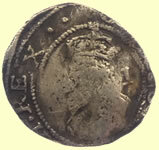 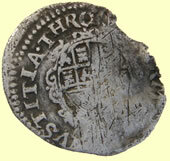 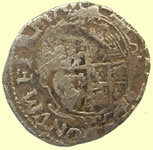 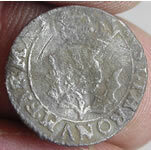 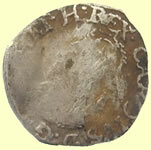 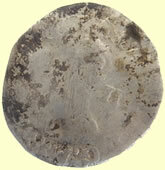 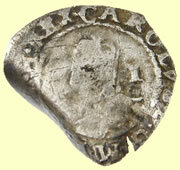 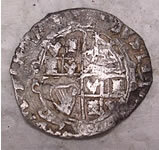 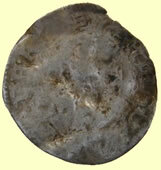 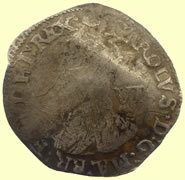 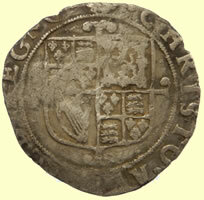 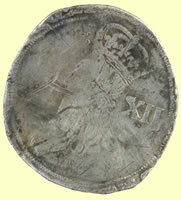 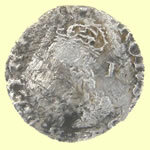 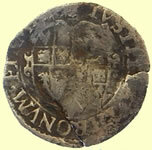 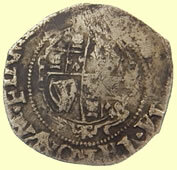 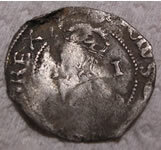 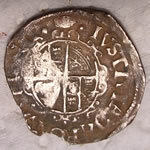 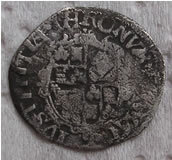 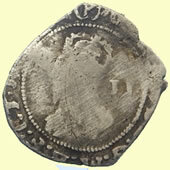 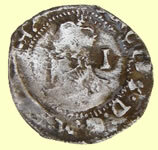 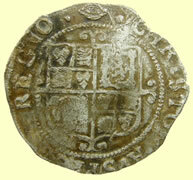 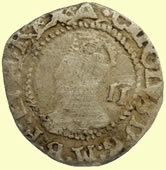 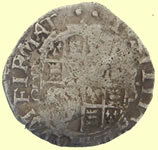 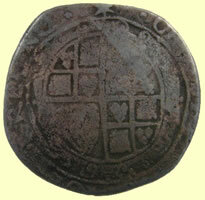 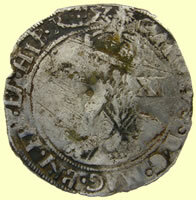 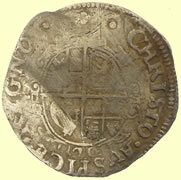 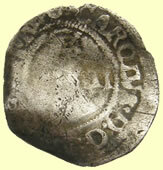 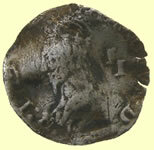 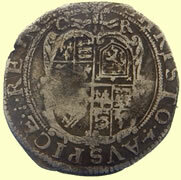 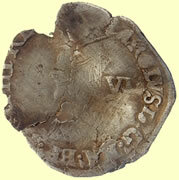 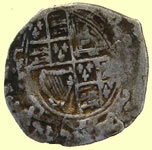 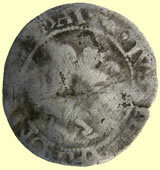 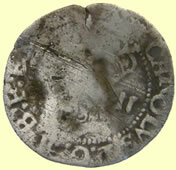 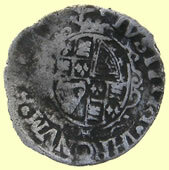 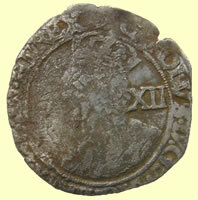 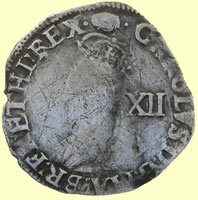 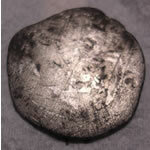 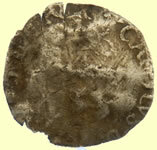 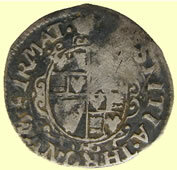 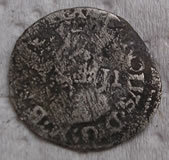 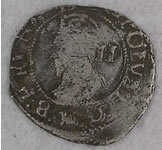 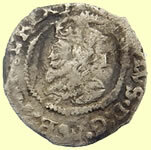 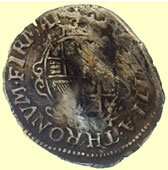 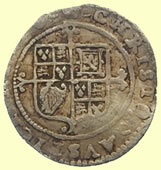 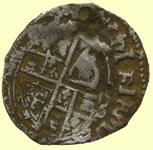 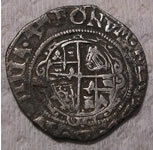 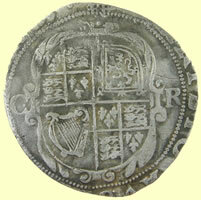 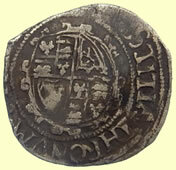 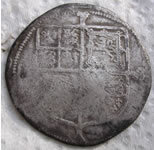 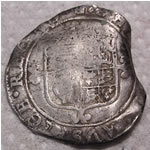 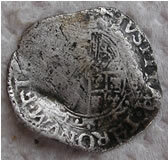 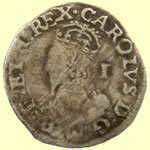 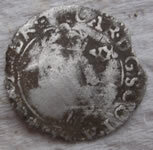 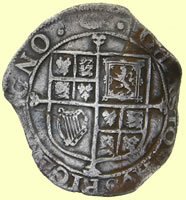 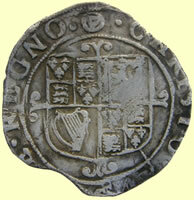 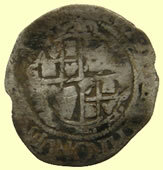 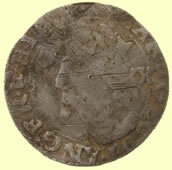 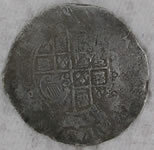 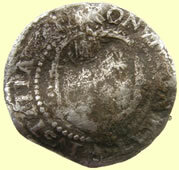 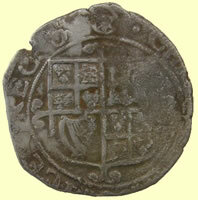 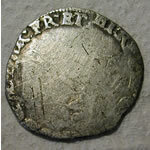 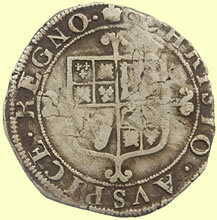 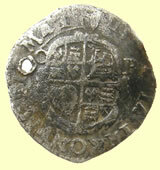 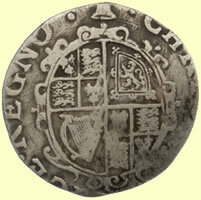 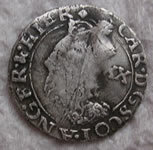 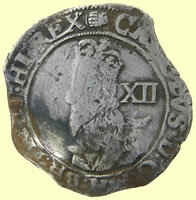 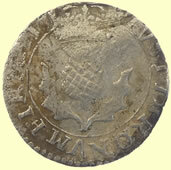 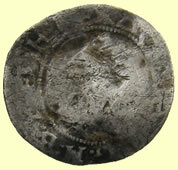 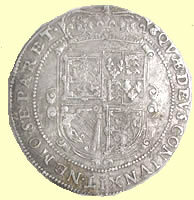 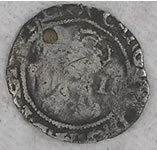 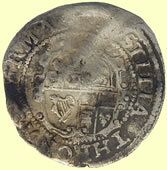 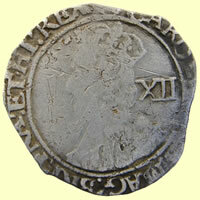 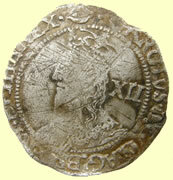 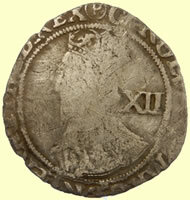 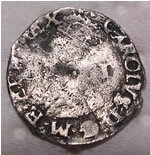 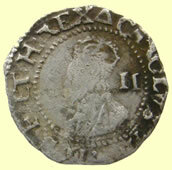 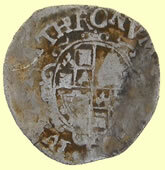 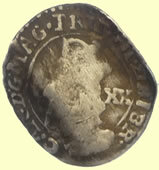 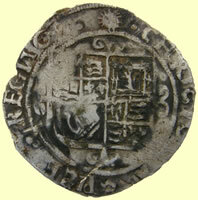 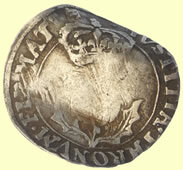 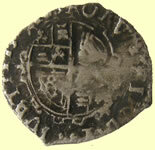 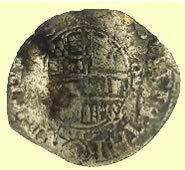 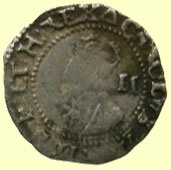 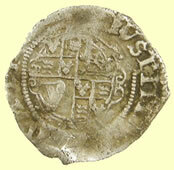 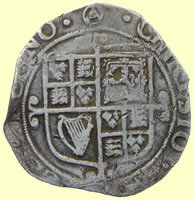 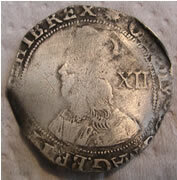 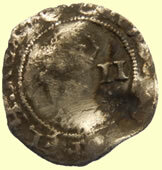 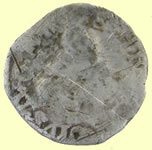 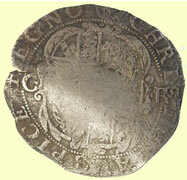 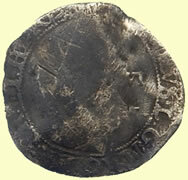 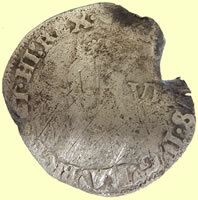 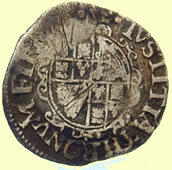 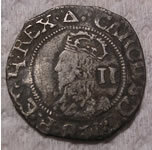 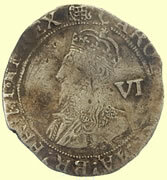 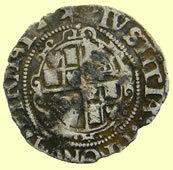 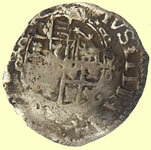 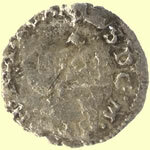 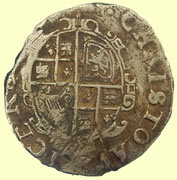 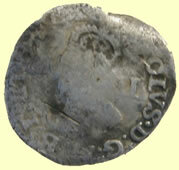 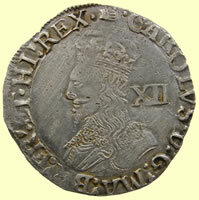 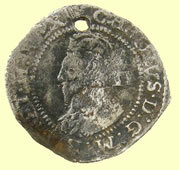 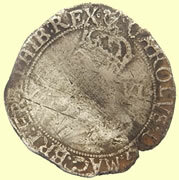 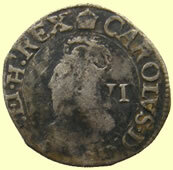 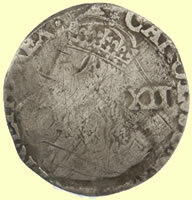 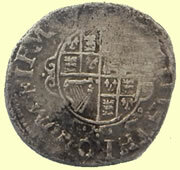 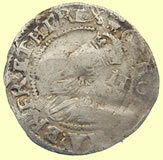 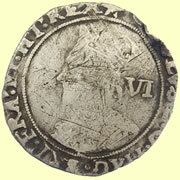 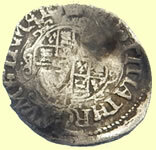 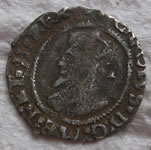 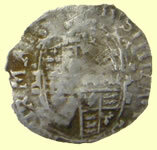 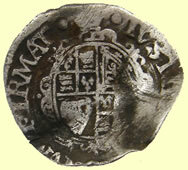 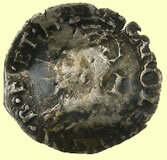 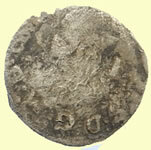 First 1645 Charles 1st hammered silver three pence we have found - double struck coin which has obscured the mint mark. 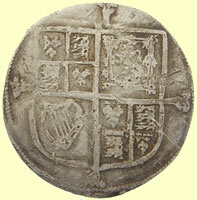 The coin has been rotated and double stuck and the combination of oval shield with this legend does not match. 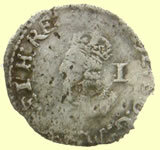 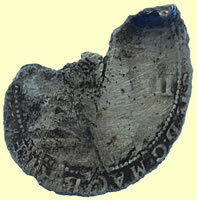 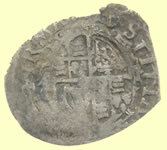 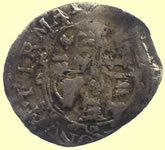 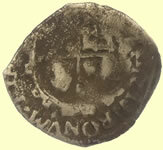 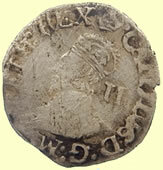 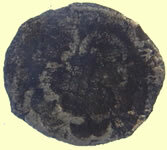 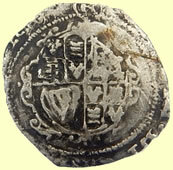 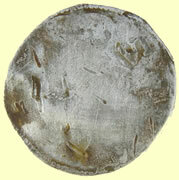 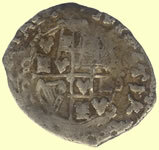 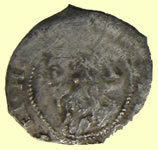 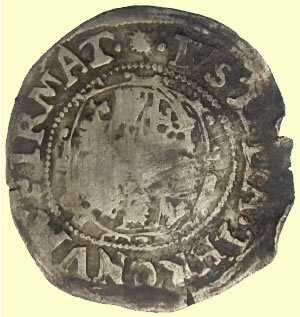 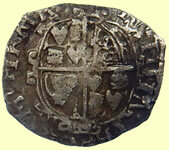 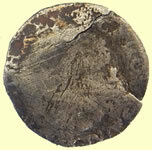 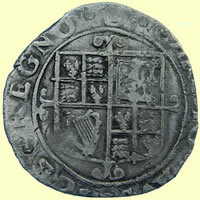 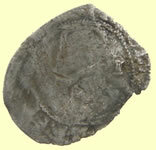 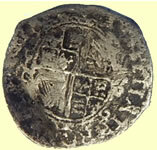 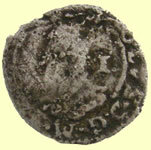 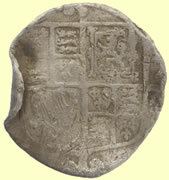 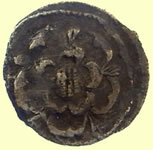 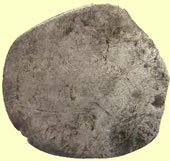 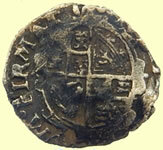 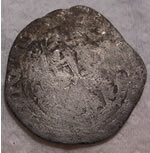 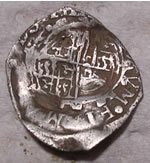 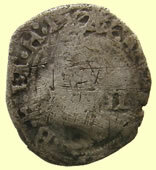 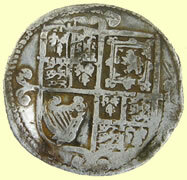 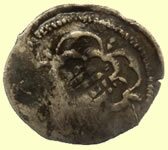 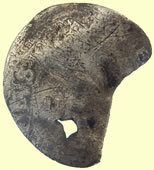 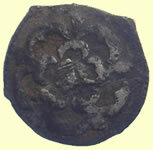 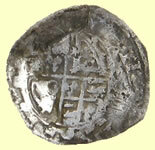 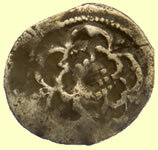 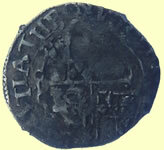 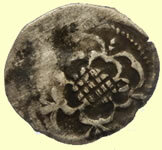 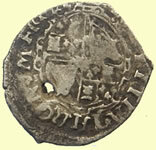 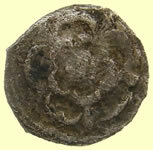 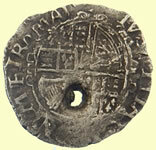 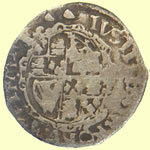 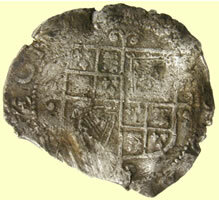 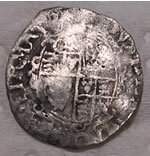 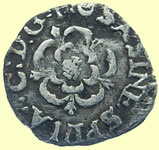 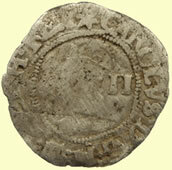 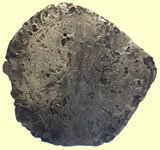 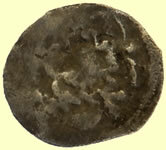 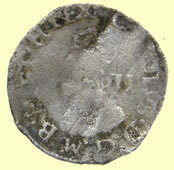 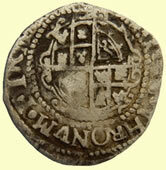 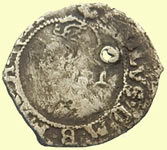 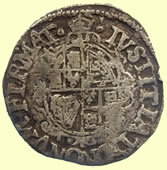 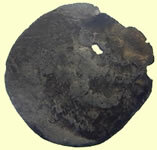 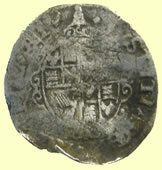 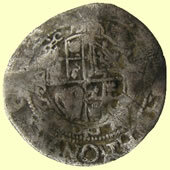 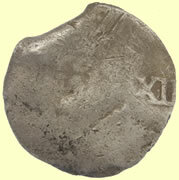 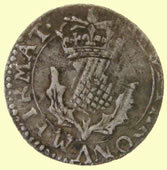 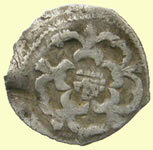 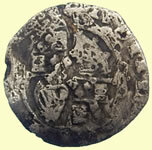 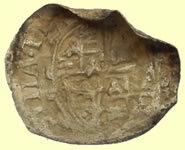 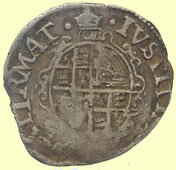 It is possible that it is a half groat and that the III behind bust is II. 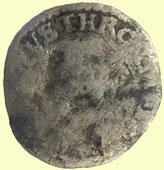 It could be a Tower half groat Group D, North 2254 but the crown is not that of a bust 4. 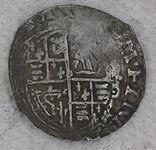 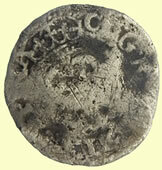 I suspect this is a very rare coin as I cannot match it in JJ North's ref book. 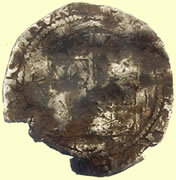 The normal Tower legend is IUS THRONUM FIRMAT and most have the CHRISTO legend. 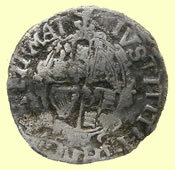 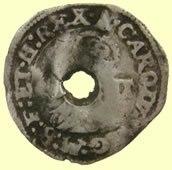 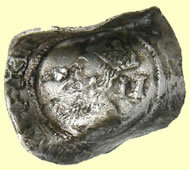 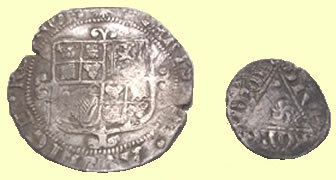 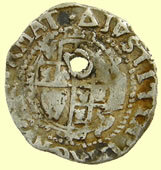 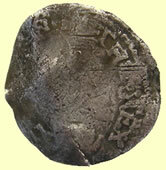 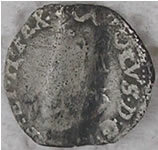 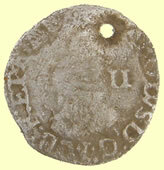 Some coins had the IUSTITA written in full. 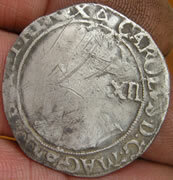 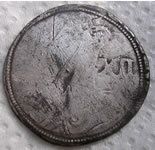 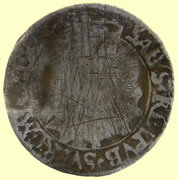 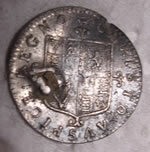 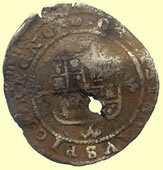 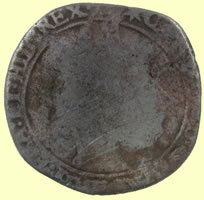 Is this an overstrike of a Ashby de la Zouche mint trying to cover the declaration coins in 1645/6 ? 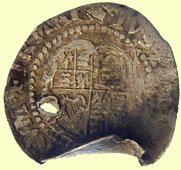 I will let the museum experts have a look when it is being recorded. 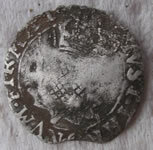 Very rare find and the first ever found here. 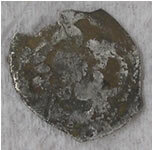 Very rare find and only the 2nd Plume type ever found here. 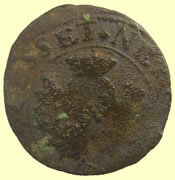 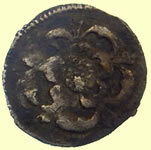 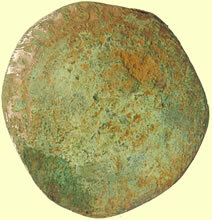 Fascinating hammered copper coin -with Scottish Thistle on rev. 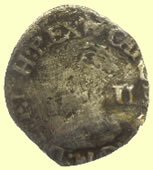 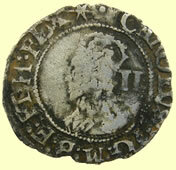 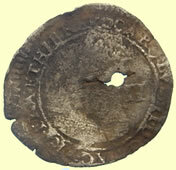 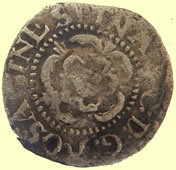 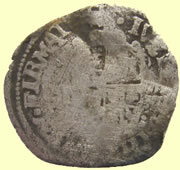 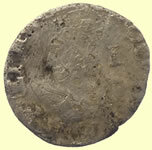 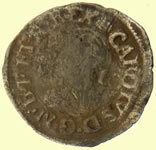 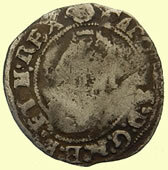 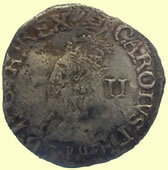 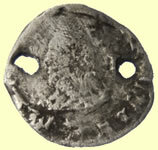 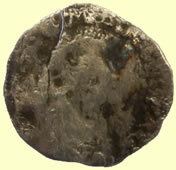 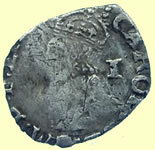 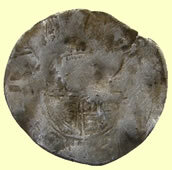 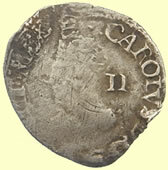 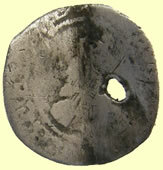 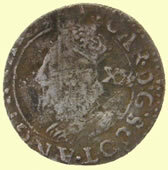 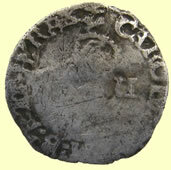 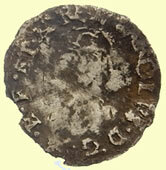 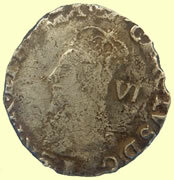 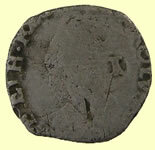 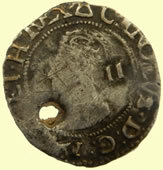 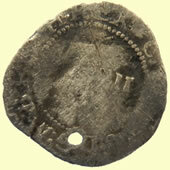 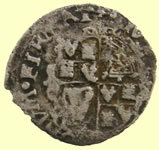 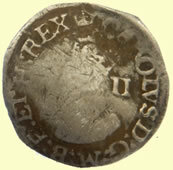 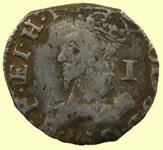 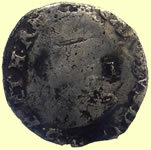 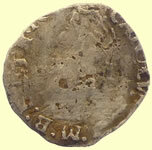 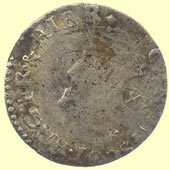 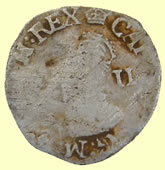 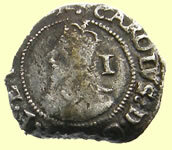 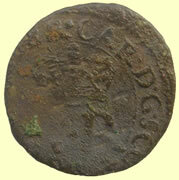 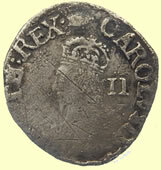 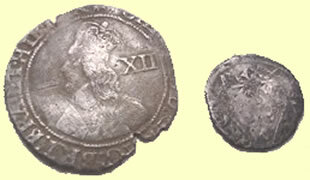 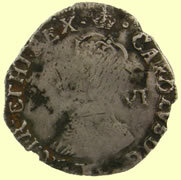 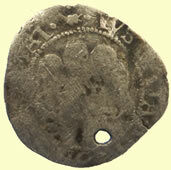 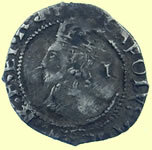 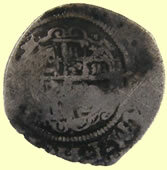 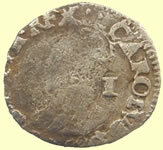 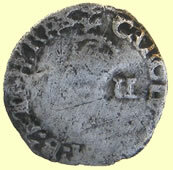 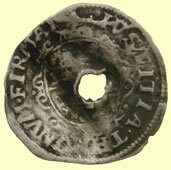 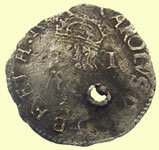 Charles I (1625-1649) copper turner or half groat (two pence). 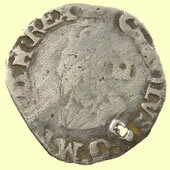 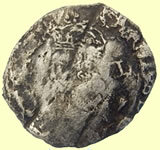 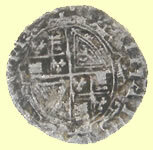 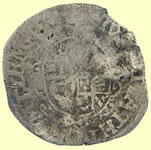 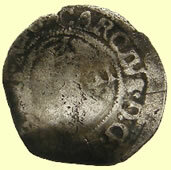 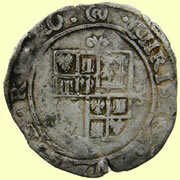 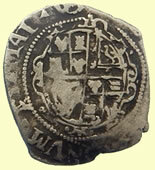 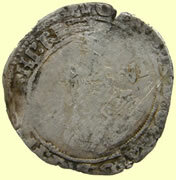 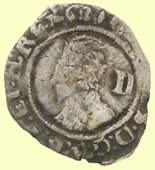 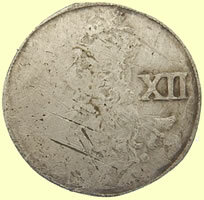 Obverse: Crowned "CR". 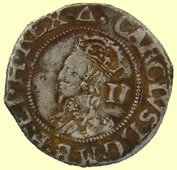 Legend: "CAR D G SCOT ANG FRA ET HIB R" (Charles by the grace of God King of Scotland England France and Ireland). 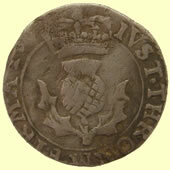 Reverse: Thistle: "NEMO ME INPVNE LACESSET" (No one shall hurt me with impunity). 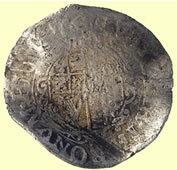 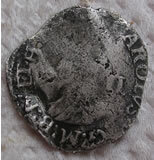 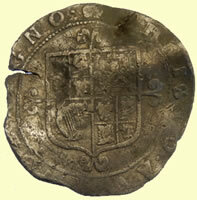 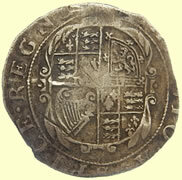 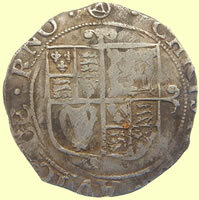 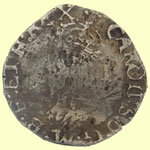 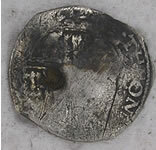 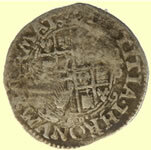 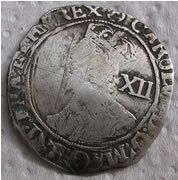 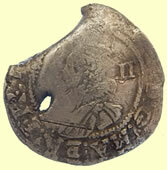 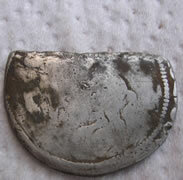 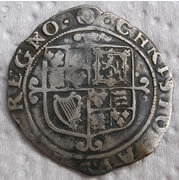 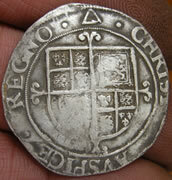 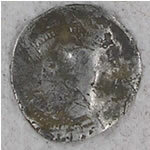 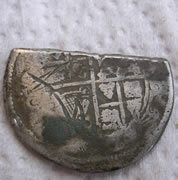 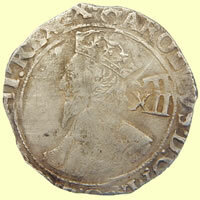 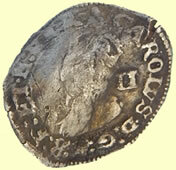 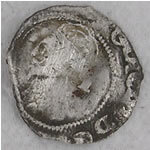 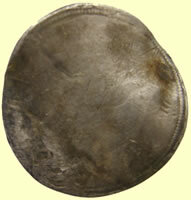 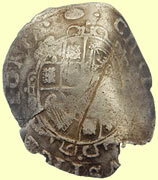 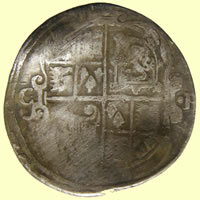 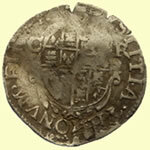 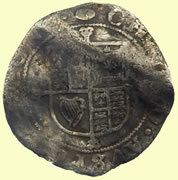 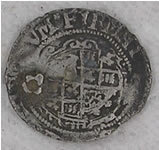 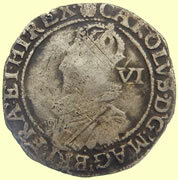 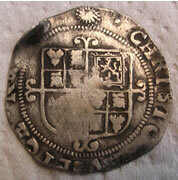 1635 Charles 1st hammered silver 6 pence - very interesting coin, has the Crown initail mark with a 1645 shield ?